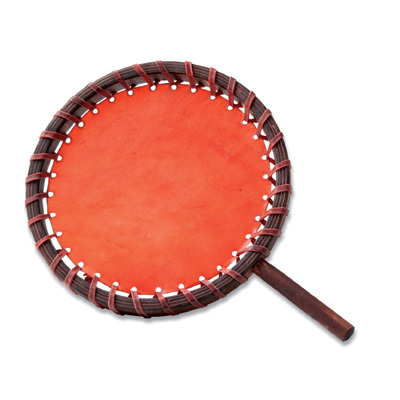 Our Alaska Fire Drum is designed in a very simple and traditional style. The thick red rawhide is simply tightened onto a red frame,and will resonate powerfully. Through the safely hidden skin inside the frame the thick drum skin is protected and tough. Good for use outside or in sweat lodges. Held by the handle creates the fullest sound. Our Alaska Fire Drum is designed in a very simple and traditional style. The thick red rawhide is simply tightened onto a red frame,and will resonate powerfully. Through the safely hidden skin inside the frame the thick drum skin is protected and tough. Good for use outside or in sweat lodges. Held by the handle creates the fullest sound.